The telescope is mounted on a specially designed carriage with support ring to stop abrupt falling. The carriage is fitted with two adjustable screws for precise vertical and horizontal positioning. This arrangement is mounted on a 25mm dia. 450 mm long steel pillar, fitted on a cast iron base with leveling screws. A scale holder is provided with scale. Tical movement by a fine micrometer screw. Focussing arrangement is given by rack and pinion. Complete on a heavy metallic stand having pillar of 18" length of15mm diameter. We are manufacturing an extensive range of teliscope. This is a good general purpose laboratory instrument. It employs an achromatic objective of 25 mm aperture and 17.5 cm focal length. The telescope is mounted on a sturdy stand with ½steel C.P. rod, focus by smooth rack and pinion, 10 x rams den eyepieces are used. Supplied with scale and scale holder. With an objective to fulfill the demands of our clients, we are engaged in manufacturing a wide array of Reading Telescope. Fitted with an achromatic objective of fl 175 mm. clear aperature of 23 mm and 8x Ramsden eye-piece with a cross- line graticule. The focussing is done by rack & pinion arrangement . Mounted on heavy metal stand. We are ranked amongst the most trusted firms deeply engaged in offering a wide range of Reading Telescope. 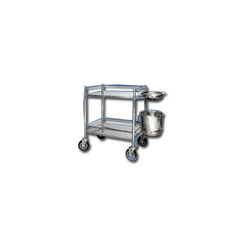 Designed for general laboratory work. The telescope is mounted on 16 mm dia. & 45 cms. High rod fitted on heavy tripod base. The telescope is fitted with 25 mm clear aperture achromatic objective & 10 x ramsden eye piece with cross wire. Focussing by rack & pinion from 1 meter to infinity. Suplied complete with perspex scale & scale holding attachment. It is fitted with an achromatic objective of FL 178mm clear aperture 23mm and 8X Ramsden eye piece with 90° cross line reticule. The focusing is done by rack and pinion mechanism with range from 1000 to infinity.